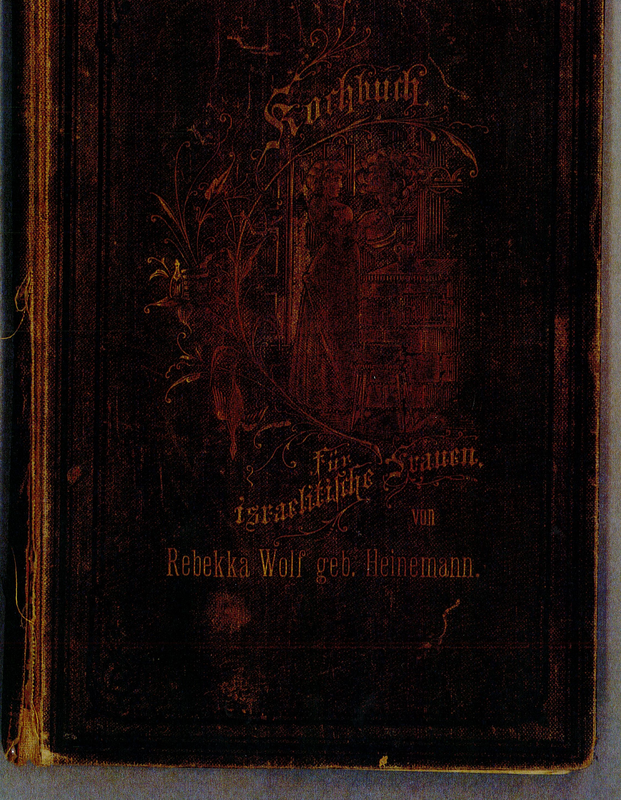 I spoke with some friends about making a recipe from Kochbuch fuer israelitische Frauen . We chose to make apple pancakes and french toast, and have a brunch together. 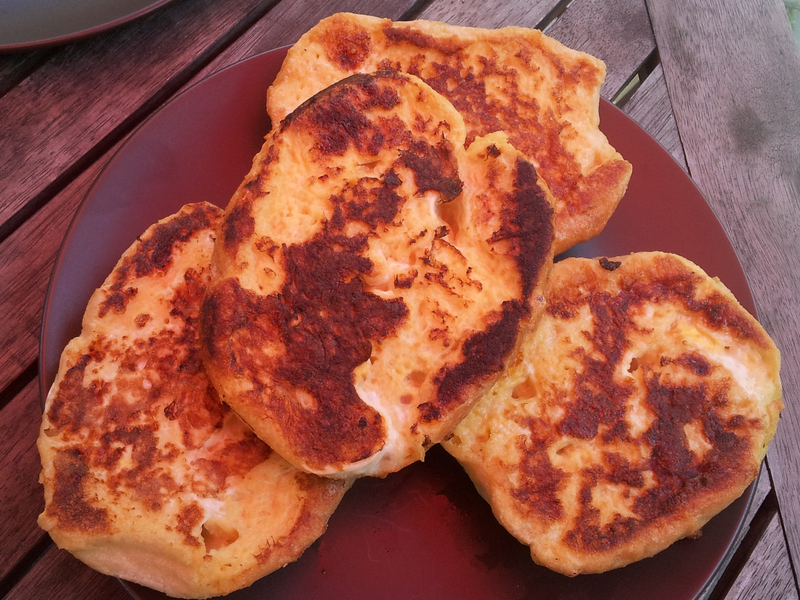 French toast, I should add, is called “Poor Knights” in this cookbook. 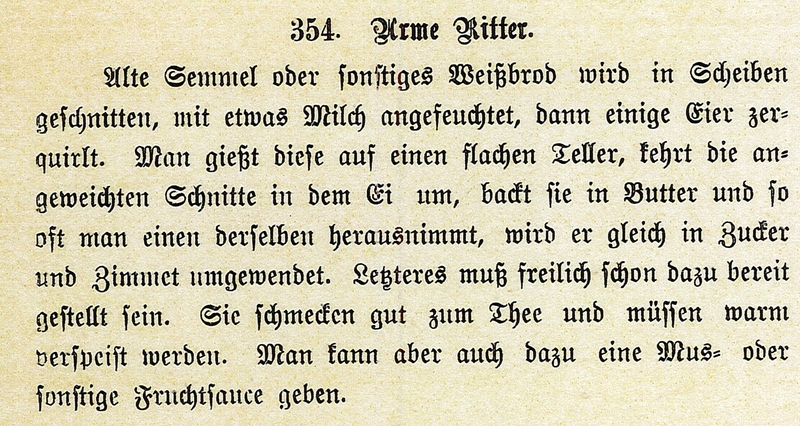 I was told by some German friends that this dish is still called “Poor Knights.” Below are pictures of the pages with both recipes. 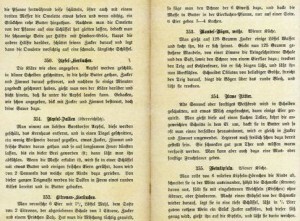 As is common with these old cookbooks, there are few measurements and not much description. 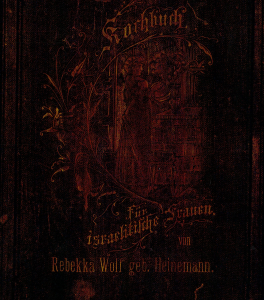 One would assume that the Jewish housewife in Germany from 1896 grew up learning recipes and the basics from her own mother (or a male cook or baker from his father, perhaps). 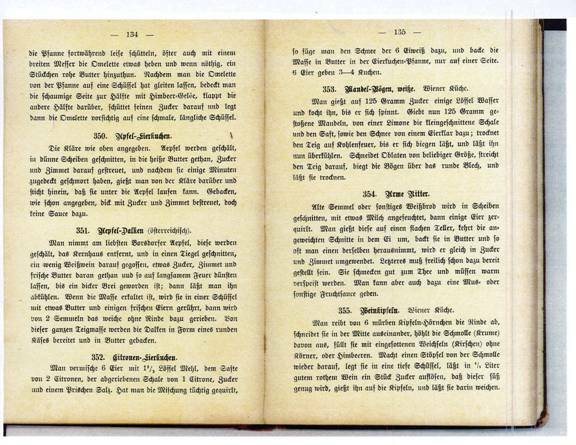 Some of the directions in these cookbooks consist of lines such as,“First make a batter” or “Put in the oven until brown and firm.” With these older recipes it is helpful to have a little direction from someone who knows how to prepare the basics. Luckily, in this case, my German friend’s mother made both these things when they were growing up. 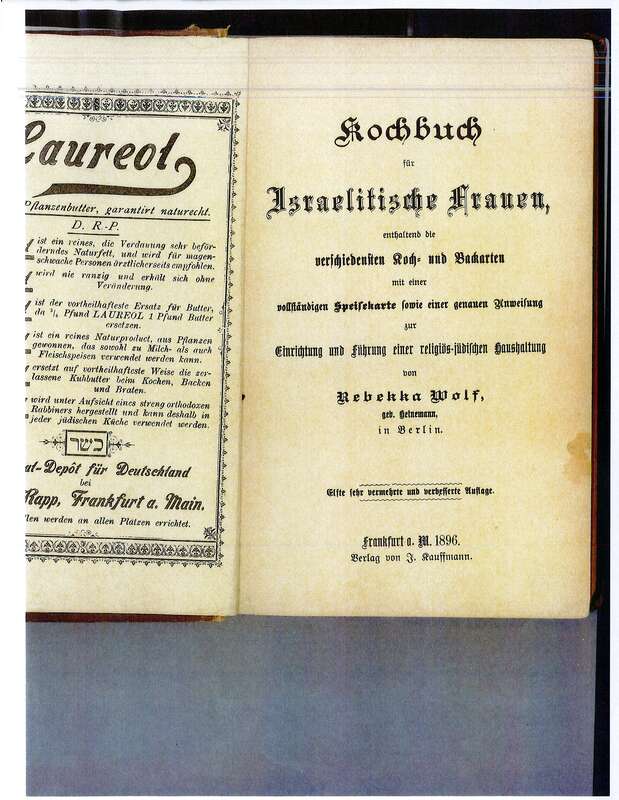 My friend laughed when she saw the recipes and said she never knew her mother was so Jewish (she’s not at all). 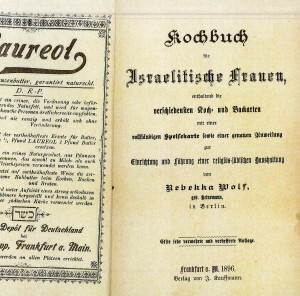 The “more Jewish” recipes that are in these books relate mostly to various religious holidays or the Sabbath. And even the Sabbath dishes are often not what stricter orthodox Jews would consider kosher. 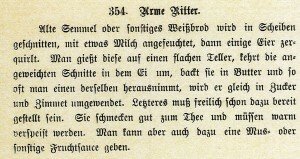 Notice we are talking about recipe 350 and 354: the Apfel-Eierkuchen and the Arme Ritter. You see how the rolls are placed in the egg-wash. 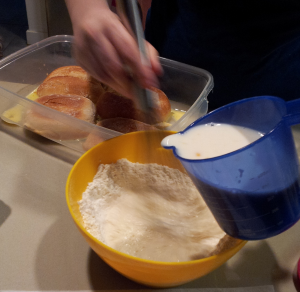 The egg wash consists of six eggs and half a cup of milk mixed in. 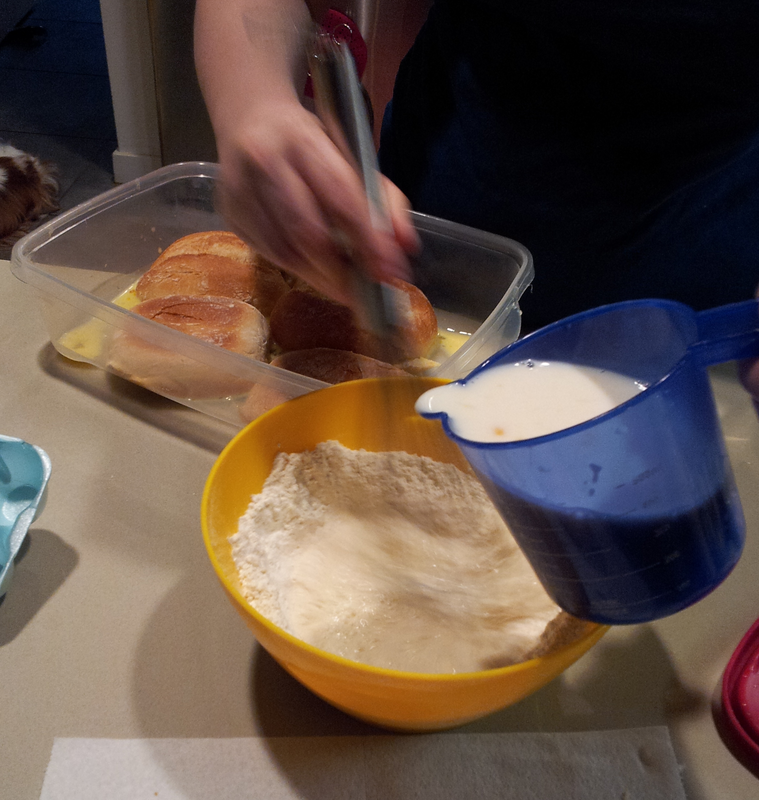 The rolls should soak in the egg-wash awhile, and then after a time you flip the rolls over. The “poor knights” pretty much absorb the entire egg-wash. So let’s do the Apfel-Eierkuchen while our “Poor Knights” are taking their bath! 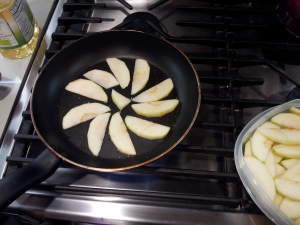 You take a greased pan and then you put in sliced pieces of apple, like so. A very pretty pinwheel, if you will. Then you sprinkle them with sugar and cinnamon. 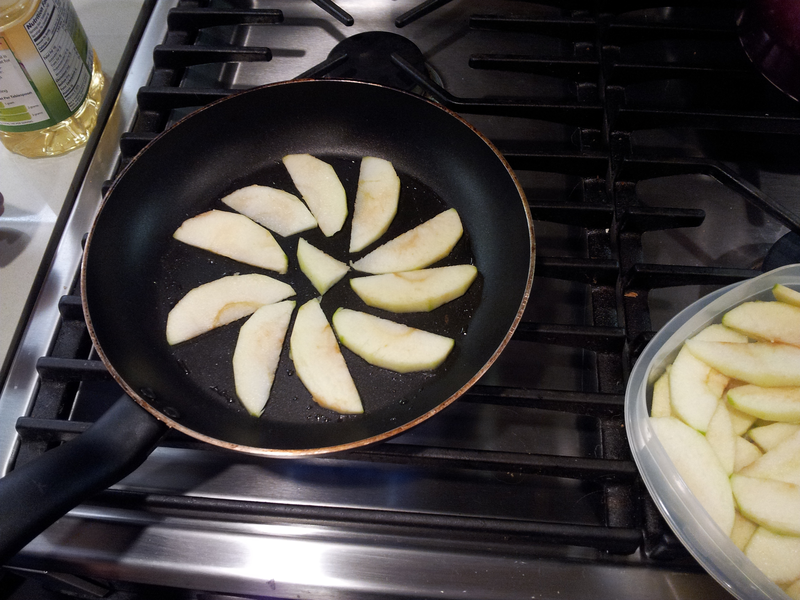 You then pour the batter over the top of the apples. It cooks like a regular pancake. Flip it over when you it’s ready. 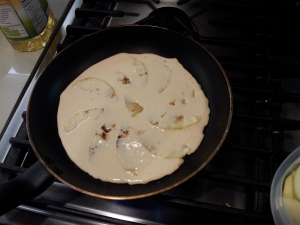 Note that, when it is made with the apples on bottom, the pancake is more difficult to flip. It should be pretty firm before you flip it, and you might need to use two spatulas. 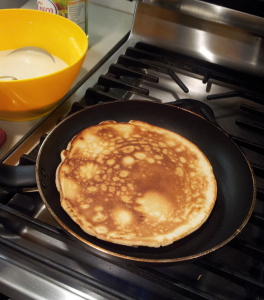 Below is a picture of our finished pancake! 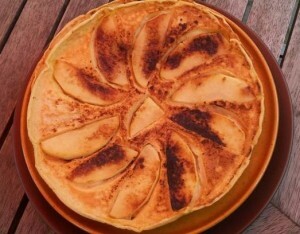 Here is what the Apple Egg Pancake looks like flipped with the apples on top, ready to serve! Meanwhile, our Knights have been bathing. 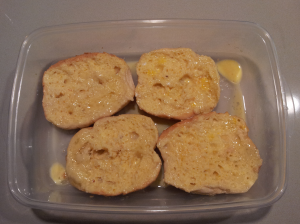 They have been flipped over once in the egg-wash, and have soaked up most of the yolk and milk. They look nice and moist. 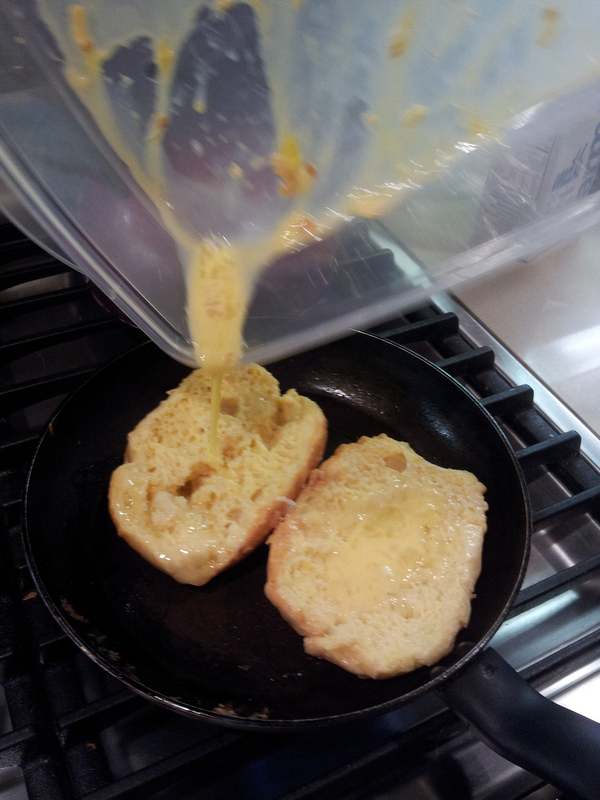 We placed them in the frying pan and poured the little remaining egg wash over them. 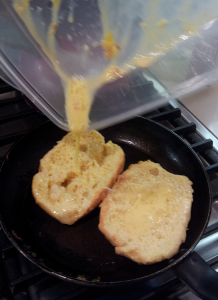 Then, just like American French Toast, you make sure each side is browned before removing from the pan. 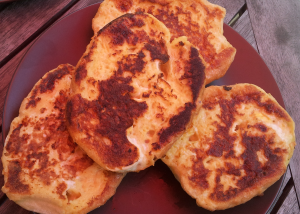 Since the Apple Egg Pancakes looked so delicious, we made more than one! 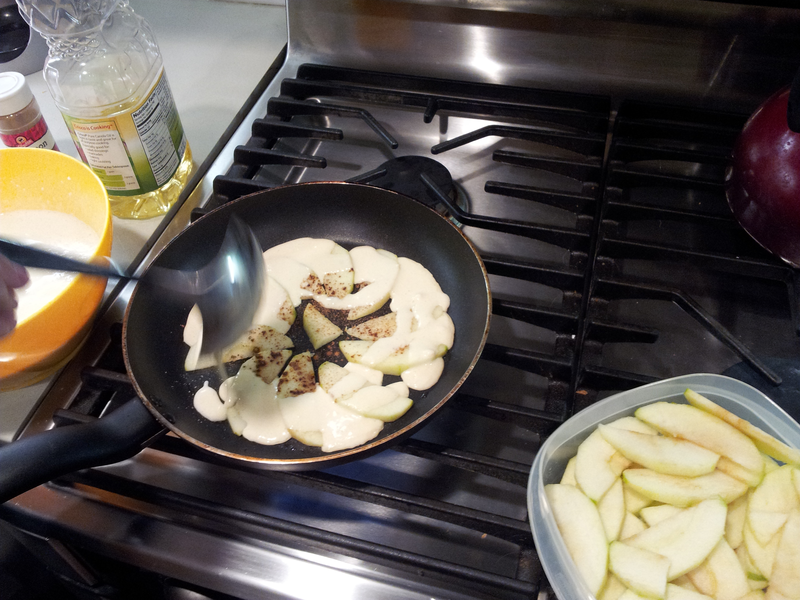 But please note that for some of them, we poured the batter in the pan and then put the seasoned apples on top. This is different than the old recipe, but it is usually how Apple Egg Pancakes are made in Germany today. 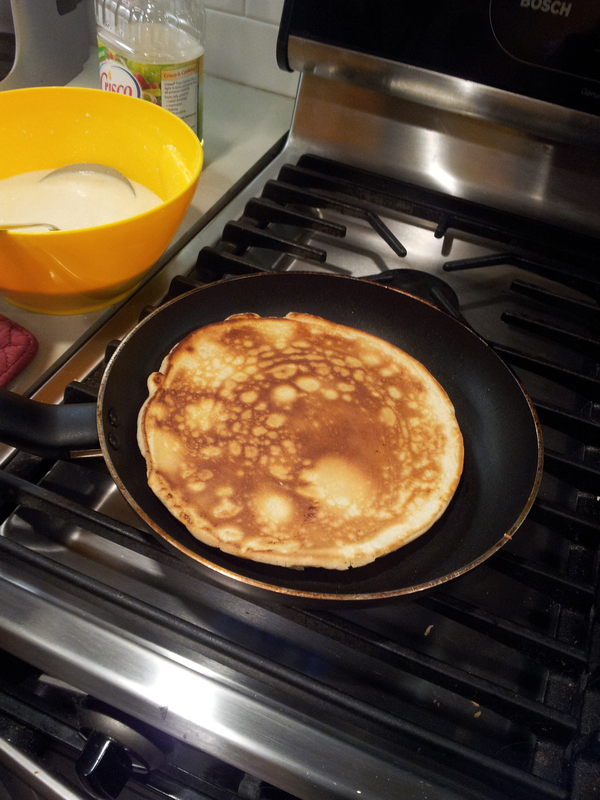 Using the current method, it is much easier to flip the pancake. 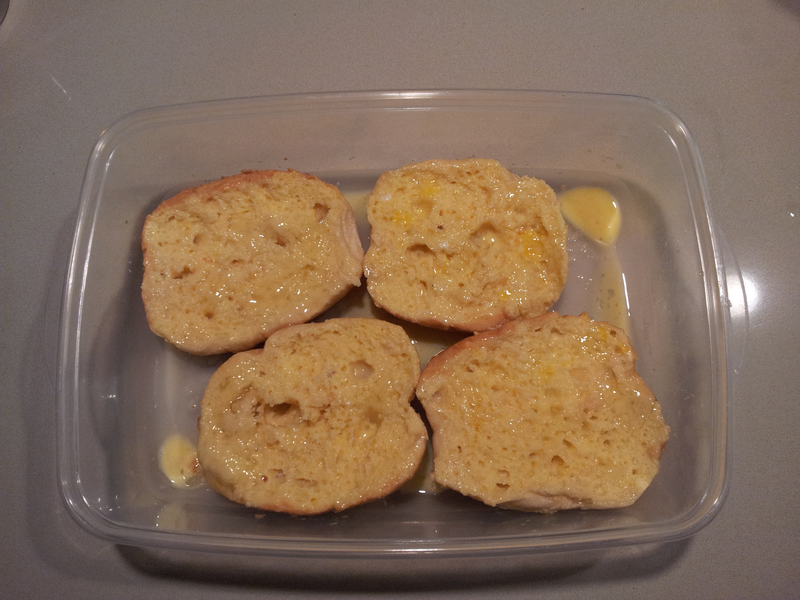 But in the original recipe, the apples are hidden from view and can be a pleasant surprise to the consumer. 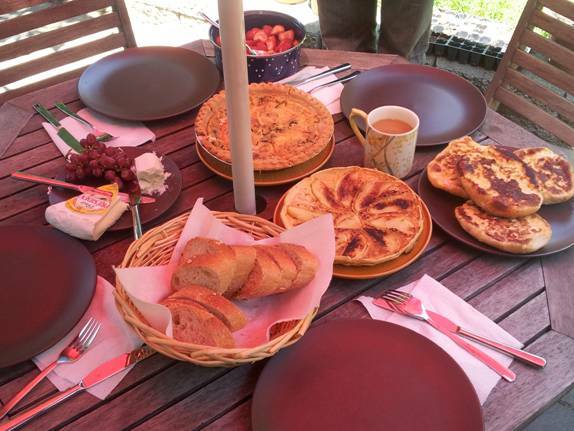 My friend whipped up a quiche and a few other nice touches, and we had our delighful 1896 German brunch in her backyard. It was a rather rich breakfast, but very delicious. Two of my German friends told me that when you are going to have Poor Knights for a meal, you should always starve yourself first! This seems like good advice!